Cocoons Fit Over Sunglasses: Fly Fishing Gear - Burleson Sporting Co.
Isolate your eyes from the elements within a protective cocoon of comfort and style. Engineered to be worn over prescription eyewear, but sleek enough to be worn alone, Cocoons provide Advanced UV Protection from the sun's harmful rays while Polarized Lenses deliver superb visual acuity. After wearing Cocoons for a short period of time, your eyes will begin to relax. The polarized UV400 front and side lenses treat incoming light, eliminating distracting glare and allowing you to focus on the task at hand. The patented frames protect your eyes from all angles, blocking sunlight, UV, glare, wind, rain and airborne debris. Measure your prescription eyeglass - across the frames from outside of temple to outside of temple. Measure your prescription eyeglass - up and down in the center/tallest part of a single lense. Download the PDF Sizing Guides below for additional assistance. Note: Designed to fit over prescription eyewear. Stylish enough for stand alone use. Note: Designed to fit over prescription eyewear. Stylish enough for stand alone use. Perfect for hunting and shooting. Creating a sunglass that can be worn comfortably over prescription eyewear is a little more complicated than designing a regular sunglass. How the frame fits, what it looks like, what it can comfortably fit over, the weight, performance and the feel all have to be considered. If a product carries the OveRx logo, no facet of the products engineering has been overlooked. The frames are engineered to comfortably float over prescription eyewear, but function equally as well when worn as a conventional sunglass. Cocoons™ are the only sunglasses in the world that will completely isolate your eyes from the elements. Cocoons feature optically correct polarized Polar TX lenses. Rigorously tested and guaranteed to provide crystal clear visual acuity, Polar TX lenses are tough as nails. Unlike disposable sunglasses, Polar TX lenses are scratch and impact resistant, designed to withstand the harshest of use in the field. Cocoons polarized lenses are available in Gray (natural color definition), Amber (enhanced contrast and depth perception) and Yellow (Low light amplification) and carry a one year warranty. Soft Touch™ is a specialized painting process that delivers a soft, velvet like finish to the sunglass frame. Cocoons are engineered to "float" over prescription eyewear. Soft Touch™ mutes any audible contact between the prescription frame and the OveRx sunglass, providing a quieter, more comfortable OveRx experience. Flex2Fit™ temples are designed to allow the wearer to manually adjust the shape and curvature of the temple of your Cocoons to best suit your needs. The temple can be adjusted easily and will remain in position, delivering a comfortable and secure fit. Flex2Fit™ temples eliminate the need for an additional eyewear retainer, unless the sunglasses are to be used in high turbulence conditions such as open cabin boats etc. Cocoons Classic and Chameleons deliver Advanced UV Protection. (AVP) AVP guarantees the performance of not only the lenses, but the entire frame design. Sunglasses featuring AVP design parameters will completely isolate the eyes, protecting from the harmful effects of the sun and the elements. 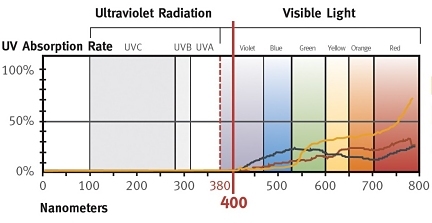 Advanced UV Protection ensures that your eyes are safely protected within a cocoon of filtered light, allowing them to remain relaxed and focused on the task at hand. The quality of all Live Eyewear products is reiterated by their lifetime warranty. Unlike the majority of sunglasses, Live Eyewear does not build their sunglasses so that they will break and need to be replaced. They build them to last. Their lenses are stronger and more scratch resistant than any other fit over sunglass in the world. Though they continue to improve their products, their warranty will never change…it's for life! Click here for a detailed description of their warranty. Click here to register your warranty online.